The SOFTFLOW Basic system is designed to control and monitor Fluenta Flare Gas Metering systems (FGM). This user-friendly solution improves the way critical information is acquired and combined by using advanced graphs and customizable alarm features. 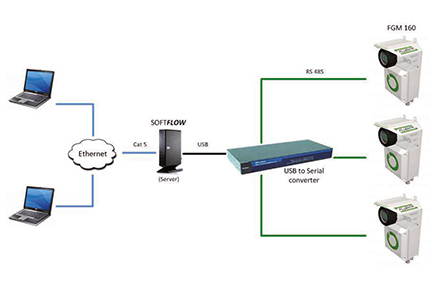 SOFTFLOW Basic allows for communicating with multiple FGMs from every computer inside the local network and is compatible with many web browsers. The Operator’s Interface is accessible via a web browser therefore also available from portable devices – PDAs, laptops, tablets, mobile phones, etc.